In recent years, we have seen a large increase in requests for rustic staircases. Considering their ability to bring natural, woodsy warmth to a home or commercial space, it is no wonder that rustic stair design is growing in popularity. Rustic stairs can be designed in various shapes and configurations with open or closed risers. Often featuring combinations of metal and wood elements, our rustic stairs feature the organic textures and shapes essential to rustic style. Our team was recently proposed with a unique challenge by the owners of Silverthorn Farm in Athens, Georgia. The couple planned to convert the loft of their barn, an equestrian boarding facility, into a reception venue for their daughter’s wedding. With a beautiful farm and loft construction underway, they were off to a great start toward planning a beautiful wedding. There was only one issue – how would the guests access the loft? Our team was asked to design a rustic staircase that would add a certain aesthetic quality to the barn without compromising the functionality of the space itself. Never turning down a challenge, our creative stair design team developed the perfect solution: a straight wooden stair, complete with a custom aluminum handrail system. The solid wood stair and open riser construction beautifully complement the rustic style of the barn and its open rafters. Though the style of the staircase is impressive in itself, what truly makes this project unique is its functional construction. In order to avoid interfering with the day-to-day flow of the barn’s floor space, the staircase was constructed to pivot up when not in use. Attached to the loft header by a large custom steel hinge, the stair can be hoisted up into the rafters using a winch. The aluminum handrail system is removable, allowing the stair to disappear, in essence, until needed for a loft event. Successfully installing a custom stair of this magnitude is a complex process and requires absolute precision. Our expert engineers and craftsmen worked to bring this unique idea to life, ensuring a seamless fit and functionality. In the heart of north Georgia, near the home of the Georgia Bulldogs, 137-acre Silverthorn Farm features a renovated barn built 150 years ago. The beautiful working farm offers equestrian boarding and services, training, lessons, horse shows and special events. The University of Georgia Equestrian Club can often be seen riding at Silverthorn. A beautiful space, Silverthorn Farm is a natural fit for those seeking a rustic wedding venue. With the addition of the loft staircase, Silverthorn Farm is able to offer even greater choices and value to Georgia brides and grooms. Along with outdoor space options near the beautiful pond and oak trees, Silverthorn couples may utilize the barn loft for ceremonies, receptions or rehearsal dinners. The loft also offers an excellent backup space in the instance of inclement weather. 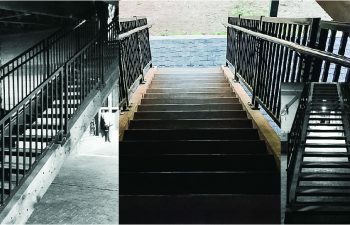 Southern Staircase is honored to have been a part of this unique renovation project. Visit Silverthorn Farm for additional information regarding this beautiful location and wedding venue. Visit our rustic staircase project galleries for additional details and pictures from our exquisite projects. From inspiration to installation our team is committed to designing and building the highest quality custom staircases. Our reputation speaks for itself and client satisfaction is our highest priority. Contact us today to discuss your next custom stairs project.